Beginning in 1940, 110,000 Jews were deported from the Netherlands to concentration camps. Of those, fewer than 6,000 returned. Ashes in the Wind is a story of murder - on a scale never known before, with malice aforethought and in cold blood. Historian Jacob Presser documents the destruction of Dutch Jewry, from isolation to deportation and , ultimately, to extermination. He graphically recounts stories of persecution, life in the transit camps, and the process of going into hiding. In this detailed narrative, the author conveys the utter despair felt by people whose whole world had crumbled. An unsentimental epilogue considers the aftermath - the "post-war Jewish attitude to life," providing a moment's relief from the incredible horror of the "final solution." 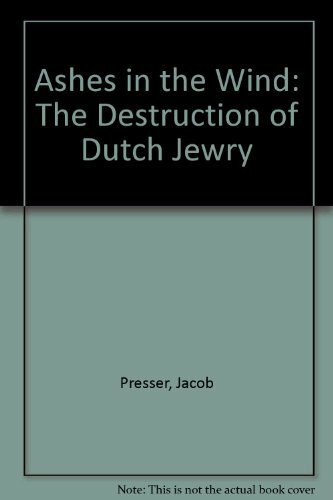 Historian Jacob Presser documents the destruction of Dutch Jewry, from isolation to deportation and , ultimately, to extermination.